Compatibility: Requires iOS 3.1.2 or later. ON SALE FOR A LIMITED TIME IN CELEBRATION OF OUR LATEST UPDATE! 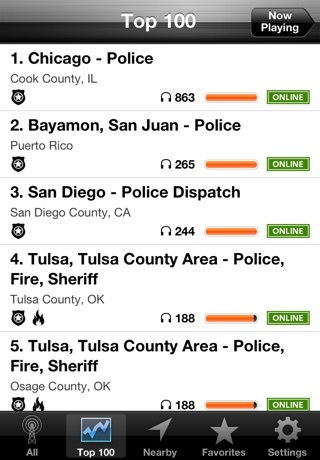 ★★★★★★★★★★★★★★★★★★★★★★★ Emergency Radio is the original award-winning police scanner app offering the most extensive database of live police, fire, EMS, railroad, air traffic, train, NOAA weather, coast guard, HAM radio, and other frequencies. 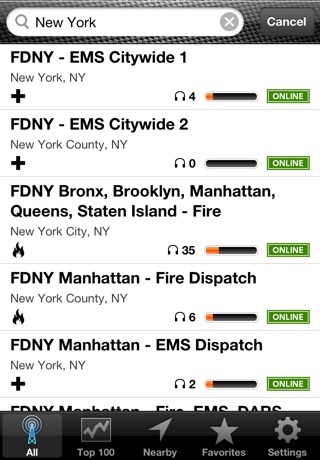 Tune in to everything from the Los Angeles Police Department (LAPD) to the New York Fire Department (FDNY). 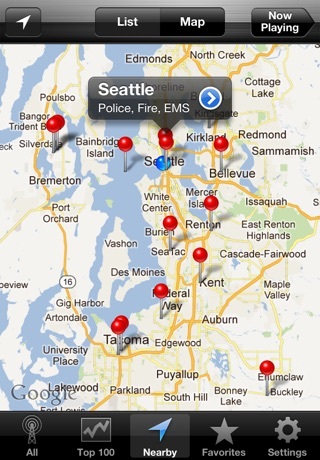 STAY UP TO DATE: ✓ Follow us on Twitter (@emergencyradio) ✓ Like us on Facebook (facebook.com/emergencyradio) FEATURES: ✓ Background playback with full support for iOS multitasking ✓ Enhanced for Retina display on iPhone 4 and 4th generation iPod touch ✓ Displays metadata for frequencies that provide it -- now you can actually see who/what you're listening to in real time ✓ Extensive ever-expanding database with thousands of live feeds (police, fire, EMS, railroad, air traffic, NOAA weather, coast guard, and many more) ✓ Daily database updates ✓ Top 100 feeds list ✓ Recently Added feeds list ✓ Feed listings show the full title, tags, popularity, online/offline status, and number of listeners ✓ The most powerful search engine available in any scanner application ✓ Advanced map view that helps you find nearby feeds using your iPhone's GPS / triangulation ✓ Listen via built-in speaker, headphones, iHome, Livespeakr, or Bluetooth ✓ Built-in scanner codes make it easy to follow along with the action ✓ Keep a list of your favorite feeds for fast access ✓ Restores last playing feed on startup AVAILABLE FEEDS: Below are a few of the many frequencies that you'll find in Emergency Radio. Please be advised that not all locations are available yet (more are being added daily!) and some feeds are only online during certain times of the day. ✓ New York, NY (NYPD, FDNY) ✓ Los Angeles, CA (LAPD, Fire, Air/K-9/Hotshots) ✓ Chicago, IL (Police, Fire, Transit Authority, BNSF) ✓ San Francisco, CA (Fire, CHP, Aviation) ✓ Boston, MA (Police, Fire, EMS) ✓ Las Vegas, NV (Police) ✓ Denver, CO (Police, Fire, EMS) ✓ Miami, FL (Police, Airport Ops) ✓ Newark, NJ (Police, Fire) ✓ Seattle, WA (Police, Fire, EMS) ✓ Dublin, Ireland (Airport, Port Operations) ✓ Detroit, MI (Fire) ✓ Nashville, TN (Fire) ✓ Philadelphia, PA (Police) ✓ Portland, OR (Police, Sheriff) ✓ San Juan, Puerto Rico (Police, Fire, EMS) ✓ Tulsa, OK (Police, Fire, Sheriff) ✓ Baltimore, MD (Police, Fire) ✓ Colorado Springs, CO (Police, Sheriff) ✓ Phoenix, AZ (Police, Fire, EMS) ✓ Cape Cod, MA (Police, Fire, Aviation) ✓ Columbus, OH (Police, Fire) ✓ New South Wales, Australia (Public Safety) ✓ Anchorage, AK (Police, Fire) ✓ Santiago, Chile (Fire) ✓ San Diego, CA (Police, Fire, Rescue) ✓ Stockton, CA (Police) ✓ Valais, Switzerland (Amateur Repeater) ✓ Hawaii County, HI (Police) ✓ London, UK (Amateur Repeaters) ✓ New Orleans, LA (Police, Fire) ✓ Tucson, AZ (Police, Fire, EMS) ✓ Palo Alto, CA (Fire) ✓ South Florida (CSX, FEC Rail) ✓ Mississippi River (St. Louis, MO Area) (Marine) ✓ Fort Worth, TX (Police, Aviation) ✓ Memphis, TN (Police, Sheriff) ✓ Austin, TX (Police, Public Safety) ✓ Pittsburgh (Police, Fire, EMS) ✓ Albuquerque, NM (Police, Fire) ✓ Toronto, Canada (Police, Fire) You can find a full list of all currently available frequencies at www.emergencyradioapp.com. Available frequencies are subject to change at any time. EdgeRift, Inc. does not own/operate all frequencies. All frequency content is provided freely by third parties. 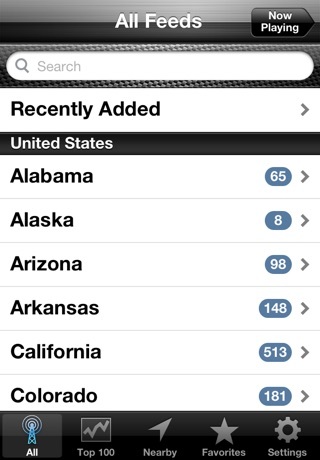 WANT TO HOST A FEED FOR YOUR LOCATION? All you need is a scanner, computer (Mac or PC), and an Internet connection. Find out more at: www.emergencyradioapp.com/hostfeed IS IT LEGAL? The feeds provided in Emergency Radio are legal; however, we recommend that you check with your local and federal laws as radio laws can differ.